As we do each year, Marc and I packed up our car last weekend and headed to Brooklyn, to spend a “Consortium Weekend” with Marc’s cousin (and my good friend) Seth. The three of us have been joining forces on Martin Luther King Day weekend since 2006, spending the weekend in absolute relaxation, leaving Seth’s place for nothing but the pursuit of culinary delights. As in years past, we didn’t even leave Brooklyn (my borough of choice), except for a 10 second blip when a cab driver made a wrong turn and we ended up heading over the Williamsburg Bridge. Uggggh. The true highlight of any Consortium Weekend is the gastronomical intake. Seth is probably the reigning champion for food consumption (of course without gaining an ounce…), and he plots out decadent, gourmet selections for us. Luckily, these weekends don’t come all that often, so even though it’s a bit of a splurge, it’s completely worth it. This time around, we had a European influence to almost all of our meals, eating at Fabiane’s, for breakfast and lunch (on 2 separate days); DiFara Pizza, where we waited an hour and a half to eat and had some of the best pizza in the word; Dressler, for our “truly exorbitant” meal; Egg for a yummy Southern-inspired brunch, and Sweetwater, which was a last minute food decision, but a good one, nonetheless. It was an amazing weekend, made only more amazing by the fact that we got home in 3.5 hours. Gotta love MLK weekend traffic. It beats Thanksgiving traffic by a mile. In other news, tomorrow is my TWO year anniversary at Big Sister. I have to say, I can’t believe how long I’ve been here. It’s been an interesting ride, full of lots of changes, but I am glad to report and to know that I am feeling very well supported by my supervisor and by my team. I think I am getting more responsibility and making new and different connections, and that’s a decent step. Also, it was good to celebrate–I received a Whole Foods gift card and a lovely card from my team. 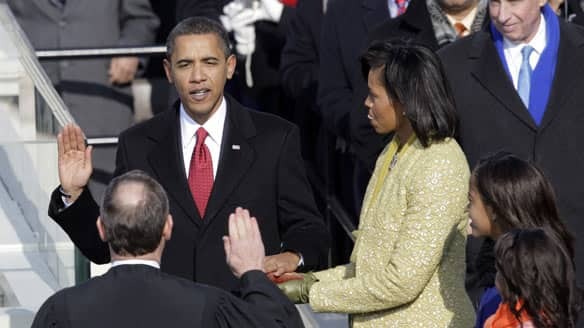 And last, but certainly not least, I was very excited and proud to watch the inauguration of Barack Obama yesterday. We watched it via CNN live feed at work yesterday. It was an extraordinary feeling to be collected in our conference room together as a staff to witness such a historical event. It was amazing to share such emotion with others–whether they were silently acknowledging the power of the moment or shouting with glee and joy at the possibility of change. It’s going to be an interesting ride to witness, and I’m excited to be a part of it. Elysa – keep writing – someday you can turn this blog into a book! Glad you enjoyed the process.